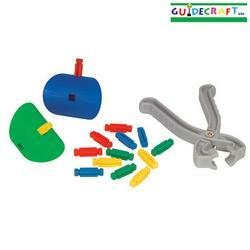 Guidecraft 16869 Twisters - 91 pcs. The FUN new construction toy with a twist. Large, brightly colored pieces are a "snap" to assemble! Twisting pieces challenge the imagination and double the fun of creating with endless building possibilities. 66 Twisters with 24 Connectors, 1 Tool. Ages 3+.